Our most recent stop, Vernazza, is a small village on the Mediterranean coast of Italy. So small in fact that upon arrival we were told to check in at a local wine shop so they could telephone the owners of our inn, Giuliano and Michele, to show us the way to their place. Thus began our Cinque Terre adventure, waiting amidst limoncino (a local specialty) and wine bottles to meet our new hosts, and then to be led along a winding pathway up the hillside to reach Camere Giuliano. This home base became so much more than just a place to sleep at night during our stay. We ate, drank, sunbathed, and watched the sun set from the terrace overlooking Vernazza below. Giuliano was born in Vernazza and literally built the beautiful Camere Giuliano from the ground up. Every stone that makes up the terrace, he carried down from the hills on his back. He continues his work as a stonelayer in addition to running this lodging establishment and also working at one of Vernazza's waterfront restaurants. Rumor has it he was once a professional football (soccer) player, too. He and his wife Michele have created a warm and welcoming home for visitors to Vernazza--the couple staying next door to us was there for their third summer holiday in a row, and planned to return next year on their honeymoon. Vernazza is one of five charming towns nestled in the hillside along the coast--the Cinque Terre. Each one looks like it belongs in a fairy tale, with colorful houses piled atop one another, stone paths and stairwa ys acting as city streets, and dramatic cliffs dropping off to the sparkling blue sea. There are no cars, and people have to take the train or ferry to get from town to town. Or better yet--hike! Cinque Terre is home to a huge network of hiking trails that on a practical level, connect these five towns, and for the outdoor enthusiast offer a huge variety of ways to explore the coast. On our first day walking from Vernazza to Corniglia, we were surprised to see so many fellow hikers in just their bathing suits and sneakers. But we soon learned why--the sun is hot and trails can be steep, and there are many opportunities to take a refreshing dip along the way. Each town has its own character, but all are equipped with the basics: a focacceria, a gela to stand, some restaurants, and rooms for rent. We ate some great pasta, of course (trofie al pesto is the local specialty, a fresh gemelli-like pasta), but a real star for us was the focaccia. This delicious fresh bread was sold at pizzerias as well as focaccerias specifically designated for its baking. There are a large variety of toppings on offer--olives, tomatoes, cheese, onions--but our favorite quickly became the focaccia ligure, named for the region. With just a hint of olive oil and salt, we would pick up a slice for lunch, a mid-day snack, picnic makings...whenever! In our tribute to food we also cannot neglect the mussels. The mussels in Cinque Terre are so fresh (these are traditionally fishing villages, after all) that it didn't matter what a restaurant did with them, they were delicious. It was sad to say goodbye to Vernazza and our new friends there, but we definitely look forward to returning in the future--maybe bringing family along as well. View more Cinque Terre pictures here. 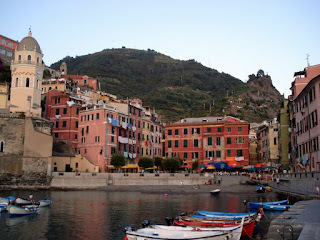 Mark & I hiked the Cinque Terra a few years ago - lunch in Vernazza was unforgetable. Unfortunately, he must have gotten ahold of bad fish, because when we got to Monterosso he ... lost his lunch. To this day, despite that little misfortune, we still think of that day as one of the best days of our lives. Enjoying your posts & living vicariously!